The president has arrived! And we had to go see him. I am not talking about Mr Anastassiades but the one who makes kebab around the corner. The new opening which has been buzzing for the past week had a lot of surprises, (fortunately) mostly good ones. Passing by I was a bit confused with the big orange sign. Although it does look like a sign of a taverna I can’t say the sign looks very tempting. In any case, I am not going to waste more ink on the sign but all I can say thank god the inside is better than the outside! 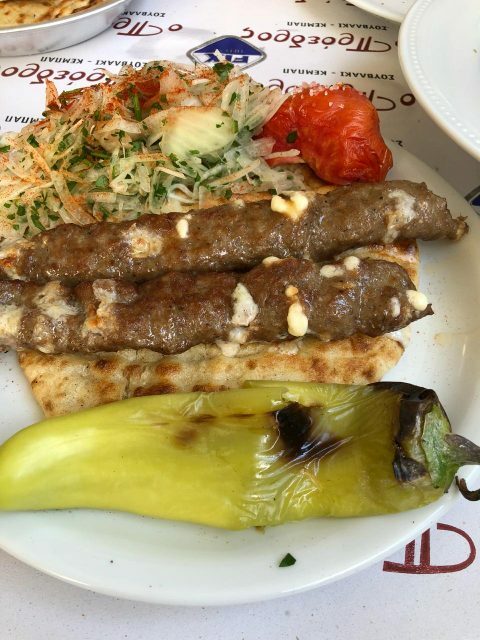 For a combination of Greek, Cypriot and Middle Eastern food in a casual ambiance visit…The President (aka “Proedros”). Pleasant, casual, colourful and buzzing are best to describe the ambiance. I liked how it looked like a taverna but did carry a more contemporary element. 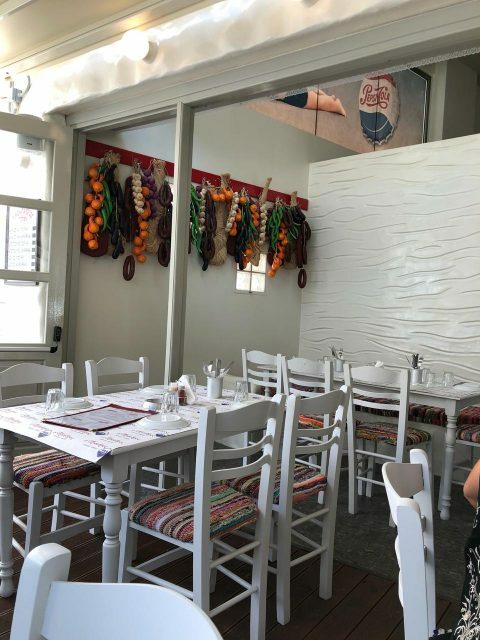 The menu is very tempting with a large selection of starters including Armenian “pastourma”, potatoes with eggs and main courses with lots of kebab. What I didn’t know is that it’s actually a Greek chain, hence the Greek influence. This could be a good thing since everything has been tested! The “soutzouki” with fried eggs was a good choice (especially given my love for fried eggs). I did expect the yolk to be a bit more runny but we enjoyed it nevertheless. 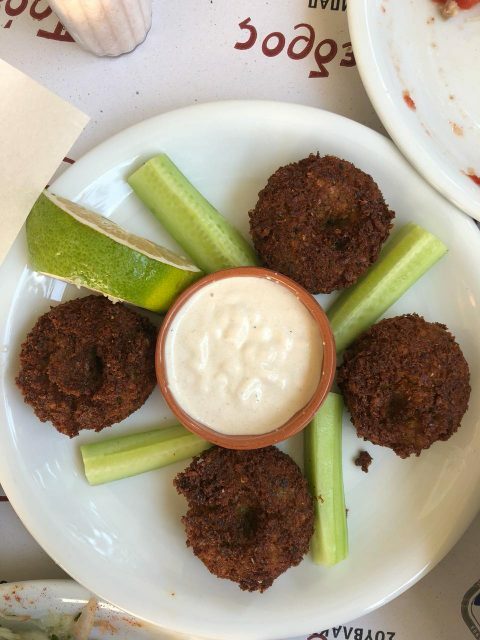 The falafel were equally tasty, quite aromatic and a great nibble to start with. The “Kaserli kebab” with melted cheese inside out was quite interesting as it was both very aromatic with herbs and strong flavoured from the cheese, definitely recommend it for the cheese lovers. We also shared fresh and refreshing “Choriatiki” salad made the Greek way. Finally we had to have what everyone is talking about, the “Kiounefe“, a Turkish dessert with kataifi and cheese. 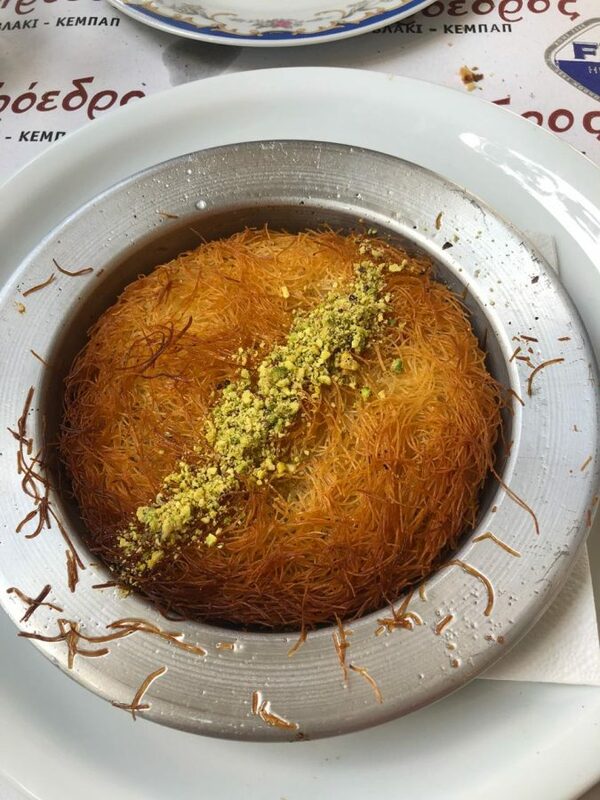 It was indeed delicious and a great inclusion as it’s a dessert hard to find. It’s easy going, (both the food and ambiance), it’s central, there’s a lot of options and also very easy for a big group. I don’t see why such a place wouldn’t do very well amongst the Nicosia crowd. I wasn’t ecstatic but left quite pleased with my lunch so it’s definitely a good addition to the “to-try” list. Value for money is ok as we paid 40 euros for 2 people with 3 beers (and we were quite full).